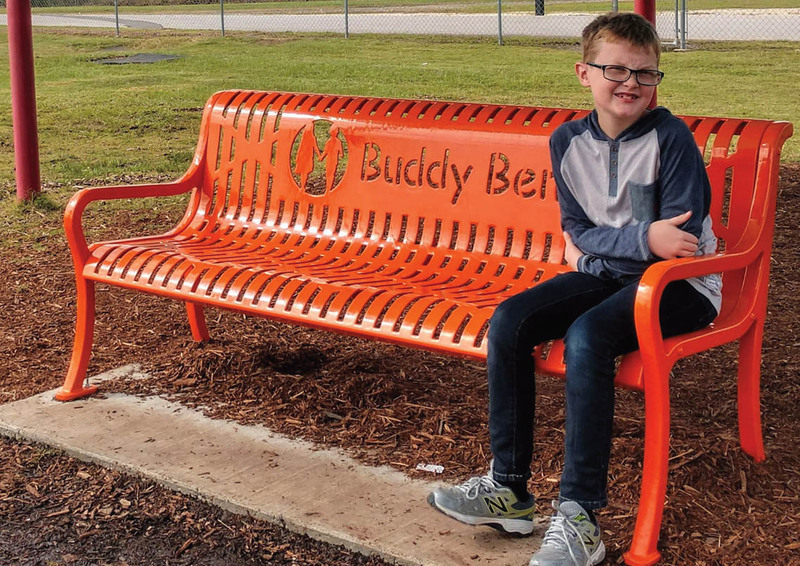 Ten-year-old Jayden Rice spearheaded an effort to raise money to purchase a Buddy Bench for his school in Malvern. When kids change our entire perspective, the world looks very different. That is exactly what my child, Jayden Rice, has been doing for a whole lot of people. Jayden is no ordinary 10-year-old. He has had a rough few years between a big move to Malvern, a high-functioning Autism diagnosis, some learning disabilities and most recently, a PANS/PANDAS diagnosis, which led to a quick spiral downward. Through it all, Jayden has always had a huge heart for people. This remained true even after being bullied so many times for not fitting into “the norm.” The past couple of years have been especially tough. By the end of the 2017 school year, he developed a real fear of children and recess. He had been bullied so many times and was so broken down that panic attacks became a regular occurrence at the age of 8. He did not want to step foot in a school or be anywhere near a playground. Throughout the summer, we chased down help for him and finally found a medical professional able to help us put the pieces of the puzzle together and found his PANDAS (Pediatric Autoimmune Neuropsychiatric Disorder associated with Streptococcus infections) diagnosis. PANS stands for Pediatric Acute-onset Neuropsychiatric Syndrome. So often, a child presents in severe psychiatric ways, such as anxiety, eating disorders, tics, OCD and behavioral regression caused by inflammation of their brain. These autoimmune diseases literally attack the brain and wreak havoc on families. Jayden’s personality, no matter the diagnosis, tends to win the hearts of adults everywhere he goes, but kids his age tend to be a different story. But, where this boy’s beautiful story begins is no diagnosis or opposition stops him from stepping out and making a difference in the world. He has risen to take his brokenness, his weakness, and has turned it into opportunities everywhere he goes. This past spring, in his third grade class at Malvern Elementary School, they were discussing ways to be kind and how to further share kindness. Jayden ran with this opportunity to share his heart and his own personal struggles with his class. He recalled back to a Vacation Bible School lesson about a child who helped bring Buddy Benches to the school’s playground. These benches were meant for those kids that felt left out and really wanted to be included in play at recess. Jayden shared that so often this was his own story, feeling excluded. After sharing his vision with the class, they were onboard in joining him to make this dream a reality. Jayden’s mission manifested in not just a Buddy Bench Project that brought his class together, but an all-out movement of more kindness. This bold boy spoke at different civic organizations, including Kiwanis, Lions Club and Rotary, and even the School Council, to share his heart for this project and gain some financial support. His classmates sold “stock options” for the bench and “Kindness Always Matters” and “You Matter” rubber bracelets in their school colors of black and orange. So here is a boy with the deck stacked up against him, and yet that hasn’t stopped him one bit. He has taken his weaknesses, shared his vulnerability and turned all his pains into opportunities to help others. I often imagine what the world looks like if we were all able to do that. To lay our struggles and brokenness aside and continue fighting to make the world a kinder and more loving place. So often, when we are in the depths of our own broken stories we forget to look up and see how much of a difference we can make. We feel like we are not adequate to make a difference, but then there is Jayden, showing us all we can do all things and be just the light the rest of the world needs to see no matter the struggles we carry.